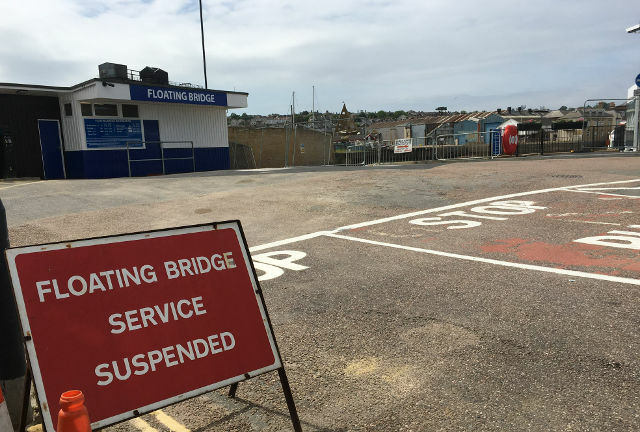 Isle of Wight Council leader, Dave Stewart, has finally said the latest floating bridge did not fit the requirements drawn up by the council and they could pursue legal action against BCTQ. The troubled Cowes floating bridge, beset with problems from the day it hit the water, could become the subject of a legal dispute. The Isle of Wight Council could pursue legal action against Burness Corlett Three Quays (BCTQ), which provided the technical specification for the bridge, and said the vessel did not meet the requirements it put forward. Floating Bridge No.6 launched in May 2017 but had to be withdrawn from service after less than 48 hours after suffering an electrical fault in the middle of the river, leaving passengers stranded on board for hours and having to wade through the water. The new bridge is the latest incarnation of a 160-year-old link between Cowes and East Cowes. The chain-link ferry travels across a 80m stretch of water, and has been operated by the council for 120 years. Leader of the Isle of Wight council, Cllr Dave Stewart, said the latest bridge did not fit the requirements drawn up by the council. The council are at the beginning of a legal process, which could see the designers taken to court if mediation is unsuccessful. “I’d like people to recognise what they did or didn’t do, and appreciate the impact that had on the community. I’d like a good bridge, one that’s good and reliable. In a statement, BCTQ said it was a world-leading naval architecture, marine and electrical engineering consultancy that had been established for over 60 years. “During this time BCTQ has provided technical advice on a number of similar assignments operating in the UK. “At the outset of the Floating Bridge 6 project, BCTQ entered into a technical consultancy agreement with the IW Council. “Under that agreement, BCTQ was required to review the existing floating bridge, and provide a technical specification for a replacement. “That technical specification included a broad concept of a new floating bridge, including a statement of requirements. “BCTQ were also required to provide technical support to the IW Council in a number of ways throughout the build process, all of which was discharged to a high degree of care and skill. “BCTQ was not responsible for the design of the floating bridge. “Moreover, BCTQ did not build it, and BCTQ does not operate it. 7 Comments on "Council finally admit floating bridge did not meet the requirements"
Take legal action against who? Who exactly provided the ship builders with the design/specifications? Presumably they built the bridge to the specs provided to them so how can they be held accountable? The main problem with the bridge is fairly obvious… IT’S TOO BIG! The engineers in the Floating Bridge Stakeholders Group have been saying since May 2017 that this floating bridge hasn’t met its requirements, that the requirements were in conflict with one another, and many of the requirements would make the bridge do fewer crossings, be less available, cause safety issues, disability issues, and generally be less comfortable and a disincentive to use! It will be interesting to see who is called to give evidence if the case does go to court or is subject to a judicial inquiry. The only organisation that should be in the dock in court over this fiasco are the council officers and councillors responsible. Their level of incompetence and coverup in this matter is staggering. having read the list of requirements. Were they the results of a school competition? To see the list of requirements, go to the Council’s page here and click on Floatinf Bridge 6.